Byron has always been a massive Rugby fan. When he heard that a couple of local dads were bringing their sons to play in a local Rugby Union team he decided to go along and watch a match. He thought Gareth might want to join up because his friend Tommy was playing. Gar was not that bothered but the girls said they would love to play. Rhiannon in particular was fired up with enthusiasm. Normally there is a practise session on a Tuesday night but this weeks was called off because of a waterlogged pitch. Rhiannon was tying her laces at the front door when the phone call came through and she was gutted. This morning we all wrapped up bright and early to go watch again. We weren't sure if the girls would be allowed to play without ever having been to a training session. As soon as we got there they were offered a team rugby shirt from the pile and were rushed out on the pitch to practise passing etc. There were about 10 of them in the team with 7 allowed on the field at any one time. The game was against another mixed team called the "Dragons" I am sure there must be a Welsh connection there somewhere! Some of the girls were so strong and fast. One was called Rhiannon too. It took me a while to realise that the parents in the other team weren't calling for our Rhiannon! The girls had a fantastic time. They both got a good amount of time on the pitch and played their skinny little hearts out! I think Byron had the best day in ages too! I got a phone call from Anne this week asking if we wanted a tree ??!!! She was in her garden digging out a beautiful palm tree that had three trunks and was at least adult height. It was blocking their view and they didn't really have anywhere else to put it. To buy an established palm like this would cost a small fortune but Anne was happy to see it go to a good home. She hauled it up onto the back of her Ute with the help of a friend and drove around and helped me to plant it in the back corner of our garden. I was given a wedding present of a hammock eleven years ago and have never lived in a house with two trees that I could attach it to. A girl can dream can't she !!! Ok, so Gina and her friends waltzed off to Sydney for the 'best weekend' of her life. There was a footy game that I wanted to watch Saturday evening, so my idea was to fill their day with as many activities as possible to tire their little hearts out. Bless 'em. Take them to McDonalds (mackers) for breakfast - what a treat from Dad! Take them straight to watch an under-9s rugby match. It was outside and bit windy. Perfect. Take them to a shopping centre so they could walk around and spend their hard-earned pocket money. Take them home for a slap-up lunch. Take them to the beach. Run around the sand, climbing over dunes and scale a large set of steps to the top of some great cliffs. Take them for a fish-and-chips tea. Take them bowling with all the other 'stranded' dads and kids for 3 hours. Carry them into the car and home to bed. Watch the footy game with a beer and a self-satisfied grin. Steps 1 - 8 worked perfectly. 3 exhausted children. Result. Well, the TV went on, the chilled bottle of beer got opened, and I promptly crashed out completely on the settee for a couple of hours missing my game. Looks like I needed the sleep too. Sunday was a much calmer affair. We had Joe and Rhonda bring their baby around which was a treat for the kids. Joe and Rhonda hadn't seen the house before so it was good to be able to show it off at it's best. Mind you, Joe rang at 7:45am (Sunday!) to arrange to come over - you can tell he has a baby, what other reason would he have for being up at that time on a Sunday? Gareth had a party to go to at 10:30, so after he was dropped off the girls and I went to the local coffee shop for some hot chocolates and marshmallows. Was it fun with Gina away for the weekend? fun, but different. Was it hard work? Kind of. Oh, and thanks to Anne-Marie for my ping-pong ball present. It's being sterilised as I type. I have just had the most amazing weekend ever! I went to Sydney with 7 other girls to watch the stage show of Priscilla Queens of the desert. We left first thing on Saturday morning so that we could do some serious damage to our bank accounts at a big Factory Outlet shopping centre. Being in our new house money is needed for lots of things (like a driveway) so I managed to be remarkably restrained, buying myself 5 items of clothing for the princely sum of $31. I had a great time being personal shopper to the others and getting my shopping buzz from helping them melt their credit cards! We stayed at the Grande Mercure apartments in Darling Harbour. We were in two adjoining apartments and they were really nice. We spent a couple of hours getting dressed up in the evening modelling our new purchases while draining dry a few bottles of bubbles. When we were all dolled up we walked the 10 minute stroll across to Star City where Priscilla was on. The bar was all glammed up in OTT mode with feather boas galore and cocktails being sold in flashing cocktail glasses. $10 for your first drink, you got to keep the glass and then refills were just $5 all night. How could we refuse! The bell went and it was time to take to our seats. What a show! It was amazing! So much happening that it was hard to take it all in. Priscilla is obviously a show about drag queens and a fair proportion of the actors didn't have to try too hard to play their roles well! We also had a line of very theatrical men sitting behind us admiring the costumes and performing running commentary on the physique of everyone on stage! The actor to get the most appreciation and stares from the guys (and us) was the effervescent "Felicia" who was played by the gorgeous Daniel Scott. Another surprise was the cameo role of "Bob" who was being played by "Alf" from Home and Away this week. When the show ended Jane persuaded us to hang out at the Priscilla bar for a few more cocktails. She told us that some of the cast were known to mingle after the show. Before long"Alf" appeared. I was so excited as I had watched many an episode of Home and Away growing up in Dublin. He was very approachable and we managed to nab him and chat for a while. I thought the night couldn't get any better until Jane nearly passed out with excitement! It was "Felicia" herself, or should I say Daniel. Jane decided to seize the moment and walked straight up to gush at how wonderful the show was. We followed and gushed some more! To our surprise Daniel didn't rush away but stayed and chatted for a while before excusing himself to go find his friends. I think at this stage our legs had turned to jelly and we were incapable of speech. I'm not sure if it was our brushing shoulders with the stars or the Strawberry Daiquiri's but we decided to call it quits and head home to our pj's before we made fools of ourselves! This morning we had a wonderful breakfast in the hotel then hit the shops again before we started our journey home to our nice normal lives as Mums once again! Guitar V Anniversary, Was it worth it? I really enjoyed last nights guitar class although I felt guilty leaving Mr B on our Anniversary. I checked the sides of the guitar which have been in the jig all week. They had dried out well from the soaking that they had while they were being bent. They have now taken on their new shape permanently. There is an area of overlap where the left and right side meets at the bottom of the guitar. While the two pieces were still clamped in the jig I cut through them so that the join is in the correct position. It will still be a while before I am ready to actually join them up. The next stage I got on with was creating the rosette. This is the circle around the sound hole that is on the front of the guitar. They are normally quite decorative and you can buy them pre-made and put them on your own guitar. An alternative is to make them yourself. It can take weeks to make an intricate one and is not something that is recommended on a first guitar. Instead of buying in a pre-made one Strato suggested using some Tasmanian Blackwood left over from the back of my guitar. I cut a simple circle out of the blackwood to sit into a recess in the pale soundboard. It was very slow work using a small chisel to cut a 1.5 mm recess into a piece of wood that is only 3 mm to begin with. The worst thing I could have done would have been to accidentally go through the full thickness of the soundboard. It was a lot of work for not much to show but not every night can be as exciting as the blow torch! Because of our torrential downpours recently the humidity in the workshop is quite high, about 80% Doing any kind of gluing in high humidity is not a good idea because when the humidity drops and the wood eventually dries out the pieces come apart again. I will have to wait for the humidity to drop to about 50 before gluing the blackwood rosette into its recess. I am going to be in the dog house tonight. It is our Anniversary and I am going out. Not with Mr B but to my guitar making class! I tried to make up for it in advance by making a really nice romantic meal last night, Steak in pepper sauce, candles, red wine, the works. I made a lovely picnic lunch for us to have in Rathmines park today while the kids were all in school and pre-school. I have even booked a baby sitter for tomorrow night so we can have an evening out of the house together. But I don't think it is going to be good enough. I'm already getting little comments from Mr B about being left alone on our Anniversary. I have one last magic trick to try to win him over..... A big bag of Peanut M+Ms that I am going to leave next to the remote as I run out the door this evening! I could just stay in but I am getting to such an exciting stage with my guitar that I am bursting for 6 O'clock to come around. I went to the work shop today to check on my sides that were clamped in the jig. When I took them out they looked brilliant. I put them side by side for the first time and you can really get a good impression of the final shape that I am aiming for. I am also on the verge of carving out the head of the guitar. I have done as much as I can without guidance from Strato and so I have to be patient until tonight's class before I can go any further. There might be a few M+M's left!!! Today we celebrate our 11th Wedding Anniversary. A big Thank You to everybody who has sent messages to us today. 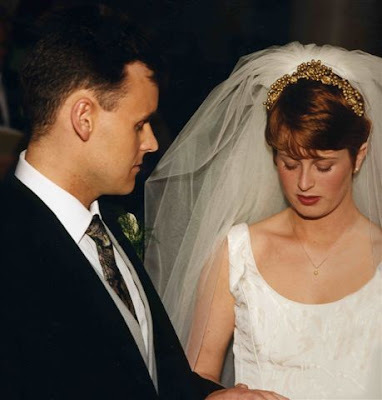 So much has happened to us since the day we got hitched in Foxrock, Dublin on June 21st 1996. We've been blessed with good family, friends, luck and health. On the morning of our wedding day, Gina and her family ate strawberries on a windy Irish beach. This has become a tradition in our family and this morning all three kids piled into our bed with presents, cards and sleepy eyes for a bowl of cold strawberries and Granny's chocolate buttons. We then got the wedding album out for the kids to look at. They had fun pointing out that Dad's hair is different now (it looked like a wig apparently) and of course there were no grey bits then. They were surprised how young Carrie, Kerry and Louise looked. Gareth pointed out that he "hadn't been borned yet". Gina has emigrated twice in the past 11 years but I'm determined that she's staying put now. 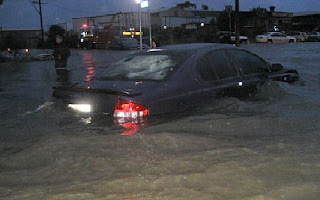 Lots of photos have been emailed back and forth about the recent storms that we have experienced. Some of the most dramatic ones have come via my friend Sandra who lives in America! It is amazing how the power of the internet keeps us all in touch all around the world! Everyone knows that the weather forecast is not an exact science. We have been through some pretty rough weather here over the last two weeks. To be fair the weather man told us the storms were on the way, we just didn't understand or foresee the damage that would be caused by them. Yesterday the weather channel started warning us of another massive storm on its way. Cyclonic force winds with heavy rain. Severe flood warnings, tie up any loose items in your yard that might become missiles in the wind, prepare to lose power as many more trees were predicted to fall. The State Emergency Service was on full standby. This time we listened. We got out candles and left them in easy to find places along with the matches to light them. We set up our new camping gas stove in the kitchen. We put the kids to bed with their new "wind-up" torches all wound and ready to light the way to the toilet. The pc and all other electrical appliances were unplugged. 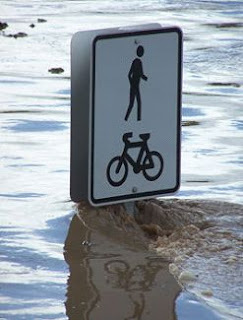 The car was moved away from the path the flood waters took last week. The trenches in the back yard were checked. We text and rang family to tell them we were ok and well prepared but that we might be out of contact again over the coming days if the power and phone lines went down. With the kids tucked up in bed Byron and myself sat glued in front of the weather channel and watched the radar pictures of the storm moving from Sydney up the east coast. We were predicted to be in the eye of the storm at Midnight. It was horribly unsettling. There was nothing to do but wait. The storm moved more slowly than first predicted and when we heard that it was due to hit at 4am we decided to go to bed and get whatever sleep we could. I can't say that we slept very well and it did rain very heavily during the night but at 5am when I looked at my bedside locker to see the electric alarm clock still working I knew that it hadn't been bad enough to lose power. When we looked out the window everything was grey but there was no major damage. On went the news and it looks like the weather system skirted around us and we only got the light tail end of it. There were a few big trees down on our way to school but nothing blocking roads or crushing the power lines like last week. For once we were thankful that the weather man not is not always right! Last night was business as usual at my guitar making class. Luckily the workshop had no ongoing damage from the weekends storms. It was a freezing cold night and the workshop has gaps in between the window frames and the walls that are wide enough to slide a paperback book into. Warm clothes are essential as is the pot of tea that we make halfway through the evening! The class runs from 6-10pm but having been for a few weeks now I have realized that time bears very little meaning. Everyone gets there when they get there, usually straight from work. No-one seems to notice when 10pm ticks along and I don't think I have got home much before 11pm any night. Byron has given up waiting up for me! Last night being a particularly cold night I was really lucky to reach the stage of bending the sides of my guitar. Bending the sides involves wetting the wood frequently and then rubbing it back and forth across a metal pipe that is red hot from a butane torch that is lit inside in it. It is a bit precarious and the aim, apart from successfully bending the wood, is not to set yourself on fire! The best part about reaching this stage was the fact that it was wonderfully warm working with a blow torch for three hours and I was cozy as toast while the others turned various shades of blue. By the end of the evening I had successfully bent one side and secured it in a "jig" This holds the wood while it dries and sets into its new shape. The other side was more tricky because I am making a "cutaway" shaped guitar which has a different shape to a normal one. The jig in the workshop is not the right shape for a cutaway so we improvised with some clamps. I really am starting to enjoy this class. At the begining I felt really self concious being the only female in the group. I was awkward handling the tools and felt very self concious practising in front of an audience of men. By now everyone has reached different stages as everyones guitar is completely different. This means that we are all engrossed in our own guitar at our own work bench and I feel a lot more relaxed. As the weeks go by we are all getting to know each other a bit more and this makes for more easy chat and laughs. Here's a short clip of the blow torch in action! 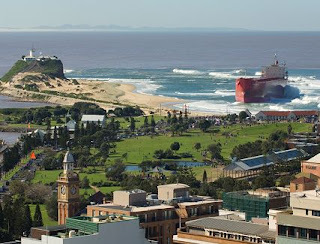 One of the many media stories being covered here in Australia and around the world is the story of the beached tanker the Pasher Bulker. It was swept onto Nobbys beach during the storm on Friday despite engines running at full throttle trying to head out to deeper water. It finally got wedged in the sand only meters from the shore. 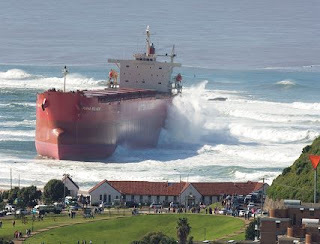 It is going to be a massive operation to push it off the sand bank and get it back to deep water. Nobbys beach is a fabulous surfing/swimming beach that we love going to in summer. At the moment it is closed to everyone for safety reasons. 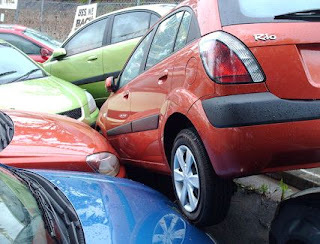 I can't imagine what will happen if they are unable to move it. There were helicopters flying back and forth to the tanker as we watched. Some were trying to deliver water to holds in the center of the tanker to stabilise it and others were the media covering the story. Well, It's been an eventful holiday weekend to say the least. We have just lived through a natural disaster. A massive run of rain storms that has caused 100 Million dollars worth of damage and claimed the lives of 9 people. It all started on Friday morning when we woke to heavy rain and strong winds. Some areas near us lost power from 7am because of trees falling on power lines. Rhiannon was sick so I decided to send Sian in to school on the school bus. It was the first bad choice I made that day, the second one was not putting Rhiannons soiled bedlinen in the washing machine straight away. By 2pm the radio stations were issuing frequent urgent messages to parents to go directly to their kids schools to collect them and get them home before the big storm hit. A quick ring around of local parents and I dashed off to collect Sian and other local kids to get them home and safe. As the next couple of hours passed the rain increased and water was racing along the roads faster than it could go into the storm drains. The water levels in our back garden started to rise..and rise...and rise. Byron and myself progressed from talking about whether the water might climb high enough to flood us to frantically talking about what we needed to do to stop it flowing in the back door. At this stage it was dark and Byron ran out into deep water and started brushing through it with a yard brush trying to make it flow around the side of the house. A storm water drain at the back of our garden burst and the water flowed down our garden like a river. It was running so deep and fast down the side of our house that it stripped all the gravel from the drainage trenches that Byron and Paul had put in last month. It was also so strong that it would have knocked Byron off his feet if he had tried to walk through it. I was ringing friends desperate for advice on anything that we could do to stop the house flooding. Because there had not been a storm this bad in over 50 years none of our friends were any wiser that us and we soon realised that they were also flooding. To add to the drama there was now thunder and lightning all around us and Byron was knee deep in storm water. I was getting really scared. Simon Meek said that he would come and help us when he sorted his own water problems. As he drove to our house in his 4 X 4 the water was over his bonnet. Another friend Peter that had offered to come around too tried but got turned back twice by flooded roads. In the end the water level stopped rising and finally dropped slightly. The rain was easing and we will never know if what Byron and Simon did was futile or made the difference between our beautiful new house flooding or not. As this drama was unfolding the radio was issuing more warnings about falling trees and asking people not to make unnecessary journeys. Then we lost power and started our marathon of no electricity, light, heat, phone or flushing toilets. We lived day to day in a cold damp house with a defrosting fridge and freezer and listening to the news on a battery operated radio as stories of flooding and fatalities unfolded. We really got away so lightly when we look back on it. About half of our friends had their houses flooded. Anything from a minor leak into downstairs rooms right through to being thigh deep in muddy water. Almost all were without electricity for days and some still have not been reconnected. They face a massive clean up over the coming week. Other people in the area were less lucky. 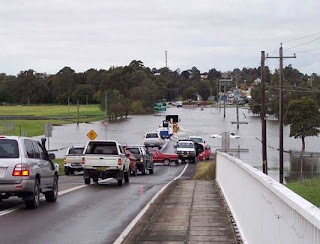 A family with 3 kids, two girls and a boy, were driving along a road 50km from where we live when the road surface cracked open and their car disappeared down into the flood water. They all died. A young man died when a tree fell on his car as he was driving back from checking on his grandmother. Just another news statistic to us until we talked to Anne and Kel and found out that he is the son of their friend. A passenger in a car that stood out of the car when it got stuck in a flooded road only to be swept off his feet and dragged into a storm drain in front of the other people in the car. Police divers recovered his body yesterday. We really are counting our blessings to be in one piece. Being through an event like this really gives you a new perspective on things. Here are some photos that I took the morning after the worst storms. It ended up being brilliant fun. There was a great atmosphere outside the stadium with food stalls selling every food type imaginable. Turkish, Chinese, Malaysian, pizza, Indian and good old fish and chips! There was music blaring and free face painting. There was also a tent where you could have your photo taken with the Socceroos! Well, you could have your photo taken in front of a green screen and they superimposed the footie team on afterwards! Again, it was all free. We saw a TV presenter doing his pre-match warm up in the middle of an open area outside the stadium. He was being broadcast onto the giant screens in the stadium and dotted around the grounds. Loads of kids were squeezing in around and behind him trying to get in the picture. We pushed Sian in his direction and told her to try to give a wave on the big screen. Just as she sidled in to the sports presenters left he turned around to ask the crowd some questions and pointed the microphone straight at her! "And where are you from Sian?" "Do you like the Socceroos?" " What's your favourite sport?" Good girl Sian! We headed into the stadium and found our seats. We were in a great spot nice and high up so the kids had a good view of the whole pitch. We were also under cover and seemed to be caught in a heat pocket so we weren't as cold as we expected to be. 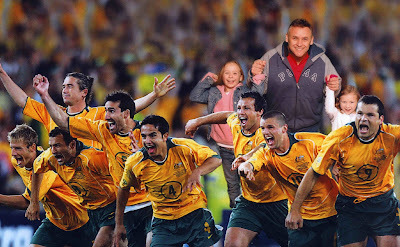 We had fun cheering on the Socceroos and even though they lost 2-1 to Uraguay the kids didn't really seem to mind. As for me I did well just remembering which colour were the "good guys"
It was well past midnight before we got home but it was a great night out and we will definitely do it again some time. Another guitar making class last night and my hands are in bits. I have started the long and laborious task of scraping the back board of the guitar so that its thickness is reduced from 3.9 mm to 3 mm. Doesn't sound much does it? It feels wrong to scribble all over this beautiful piece of Tasmanian Blackwood with a lead pencil but I have to do this so that I know where I have scraped and where I have to do some more. The idea is to scrape enough wood off so that the pencil marks disappear. I am using a cabinet scraper to do this. It looks like a metal credit card and I use the sides to scrape back and forth over the wood. It is similar to scraping the ice off the windscreen of a car on an icy morning only a lot harder on the hands! Each time I scribbled over the wood and then scraped the surface it took about 20 minutes and each time I measured the thickness afterwards with a digital calipers I had only scraped away 0.1 of a millimeter..... It was going to be a long night. After a couple of hours I resorted to using a belt sander. Not as purist as I was hoping to be but my hands were screaming out for mercy! I am hoping to go back to the workshop this coming week while Gareth is at pre school so that by next Thursdays class I am ready to move on to the next stage. Otherwise I could see this guitar making taking a long, long, long time!